In today’s digitally connected world it’s critical that you don’t sit on the sidelines and observe—you must actively engage with your customers. Elena Lockett at FM Outsource, digs deeper into the hidden side of social media. So you’re available on Twitter, Facebook, LinkedIn and even Google+ – you’ve put your brand out there on social media, and even that makes you better than the vast majority. You respond to your mentions by replying, liking or giving a nice little retweet. You’re engaging using reactive customer service and picking up any query that comes your way – that you have knowledge of. But social media is a big place, and there are a lot of conversations that take place away from the main stage, without you even knowing. The problem is, you might not know what a customer is saying about you, if they don’t directly mention you, but you can be certain the public do. Brand reputation can be destroyed in a second, whether it’s from a disgruntled customer or someone wanting help and never receiving it. So the right way to deal with these indirect mentions is to engage, not just observe. You may think the majority of customer service tweets included a tagged mention of the business it relates to. Yet, from the 37% of tweets that were Customer Service related, less than 3% actually use the @ symbol. This means watching your tagged mentions is not covering all the communication channels, and you could be missing out on engaging with a very important query. Indirect mentions have as much importance as direct, which is where Twitter’s search function comes in handy. 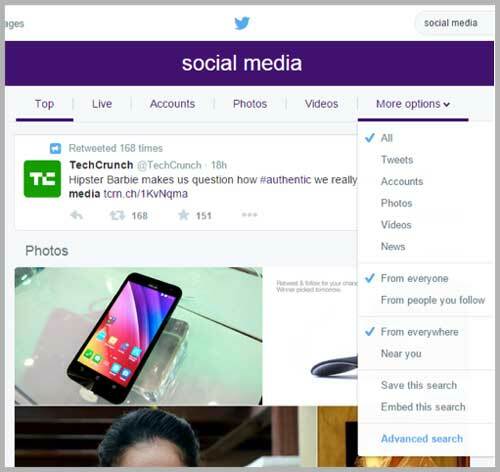 A quick look using the Search bar on Twitter will show you exactly what your brand has been missing. From exact matches to misspelling your own name, it’s easy to keep your eye out for lot of indirect brand mentions. You can even take it one step further and simply filter data based on keywords, locations and language that you know relate to your business. So even if customers aren’t tweeting your brand name, but are tweeting about you, you can still catch almost every issue. Did you know that 96% of untagged brand mentions go unanswered? If a customer wants an answer from your business, their best bet is to directly contact them with a question. But those who aren’t using your Twitter handle are some of the most important people to connect with. Whether they have chosen to miss out the @ handle intentionally, or if they simply forgot, those customers had something to say (good or bad) and that demands action. The majority of the time, when a customer contacts you via Twitter, it turns out to be negative. Whether it be a product issue, a problem with a member of staff in store or a late delivery, the list of possibilities is endless. And if that customer doesn’t @ mention you, and it gets lost in the social media sphere, you might only find out about it when it goes viral. Some of the biggest businesses have fallen to the curse of indirect mentions and missed out on crucial engagement opportunities that could have completely changed the view of the customer. Ocado missed out on two chances to salvage their customer-business relationship, when customers didn’t @ mention them in their tweets. Ocado could have contacted this customer to make alternate arrangements, without them having to look elsewhere. Especially when the fact this customer asked for help means more and more people would find out about Ocado’s slip up. With the second customer, again they could have responded and offered their next delivery free of charge, or at least apologized. Both opportunities were missed. The worst thing you can do with a negative tweet is ignore it. Even if what happens after the tweet is sent is the worst thing imaginable, you need to say something. You’re only more likely to make the customer upset, and perhaps tweet about you not responding, which is not the kind of marketing any business wants. To stay on top of these negative indirect mentions, it is important to keep your eye on keywords specific to your brand and your brand name without the @ symbol, and to include spelling mistakes too. Now, it’s not all negative in the world of indirect mentions. In fact, many people tweet businesses with positive feedback and happy stories, but simply don’t follow the business or forgot to tag. And who doesn’t want to celebrate your business’s successes, even if it is only making a customer happy by getting their parcel there super-fast or a particular member of staff going the extra mile? In a world of so many complaints, it is vital the happy moments are shared to the world. 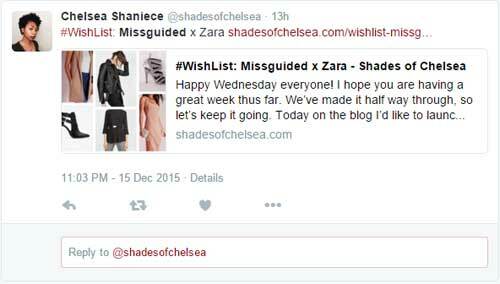 Here could have been a perfect opportunity for both Missguided and Zara to interact with this blogger to perhaps promote her blog post or even offer a discount code for blogging about their clothes, but because she didn’t @ mention them, they failed to pick up on it. 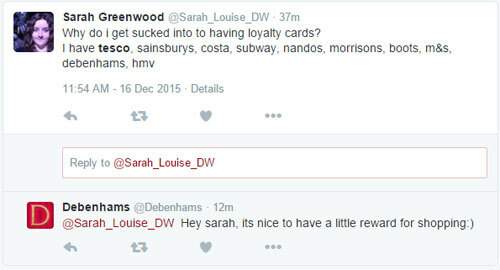 Debenhams perfectly show how you can interact with positive indirect mentions. After being mentioned alongside many other high street retailers, they were the only one to respond and therefore are most likely to have improved that customer’s opinion of the brand. Even though this tweet wasn’t 100% positive, it wasn’t negatively affecting the brand, so engaging with this kind of interaction is hugely important to change the view to positive. Watching relevant keywords and hashtags can also be a great way to create new relationships with users who aren’t already customers. Companies who engage with tweets which have no relation to their brand are much more likely to increase their customer base. Imagine how special you’d feel if you tweeted about needing a dress for a party and Topshop replied with a friendly non-sales response. 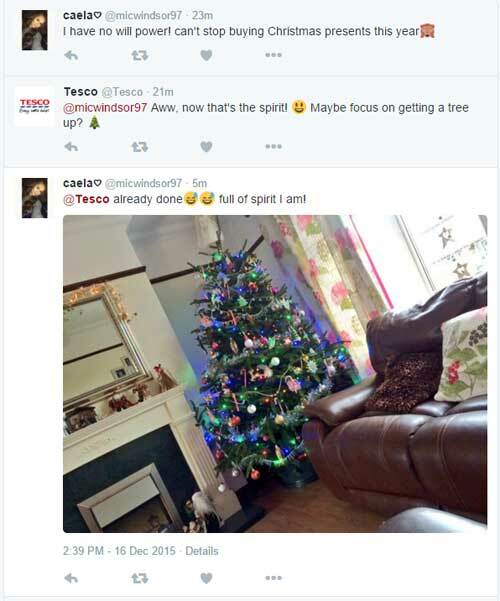 Tesco are one of the champions when it comes to interacting with any tweet they can, helping boost their brand awareness across Twitter and showcasing their fun personality they are so well known for. It can be easy to simply use social media to interact with any queries that come directly to your business, in fact many businesses still do! But brand awareness is bigger than replying to direct mentions and you should be able to engage with any tweet involving you, whether that be a tagged mention or a misspelling of your brand’s name. Elena Lockett works for FM Outsource, who provide outsourcing solutions for businesses of all sizes across customer services, digital marketing and IT development. 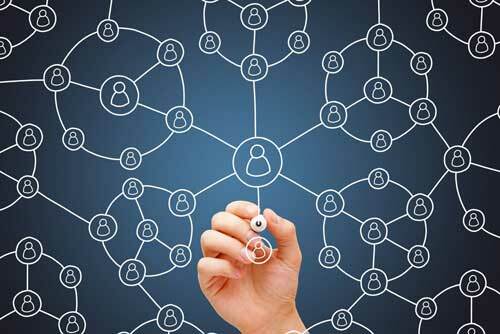 Previous article: Omni-Channel Is Hot News So What’s the Hitch?